The intent of the WCQI grant program is to assist local governments in addressing issues that enhance valley-wide sustainable use of water. Through this program, the Water Board seeks to foster innovative and collaborative projects. Projects were selected for recommendation based on a range of factors – including how well the project meets the goals of the program, the amount of funding available, and whether the project supports other regional initiatives, such as the Sustainable Water Strategy and the Okanagan Basin Water Supply and Demand Study, and basin wide priorities of the Board (e.g., source protection). Armstrong’s Water Conservation Communication and Outreach project was completed in August 2006. The grant funds were used to hire a student who worked on a number of water conservation and public education ventures – from developing a rebate program for rain barrels to xeriscaping the City of Armstrong’s garden. 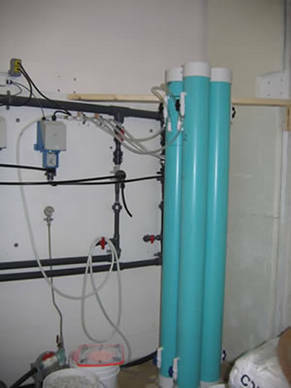 The target population for these initiatives included residents of the City of Armstrong and the six water districts who receive their water through the city. The xeriscape garden was a notable achievement, planting the city gardens with a host of drought and shade tolerant plants. One of the goals for the garden was to place emphasis on efficient irrigation, and so funds were used to repair the drip irrigation system. Monies from this program were also used to sponsor a xeriscape workshop, so that residents could learn how to use these water-conservation techniques at home. 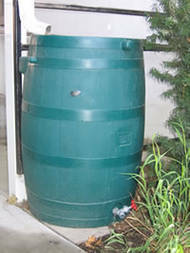 The rain barrel rebate program was initiated through Shepherd’s Hardware and offered a $25 rebate for rain barrel purchases by City residents and those of the six water districts. Four brochures were created in a series entitled “Water: A Limited Renewable Resource”. The Grandview Waterworks District is within the Township of Spallumcheen’s boundaries, but is independent of the municipality. The District is using WQCI grant money to assist in the purchase and installation of water meters. There are 96 connections on the Grandview Waterworks District and 12 already had meters prior to the WQCI grant being awarded. With the help of these funds, it is estimated that all connections will have meters installed by 2006 year end. The data gathered in this program will assist the district in better managing the water resource for their customers, and will also contribute to the Groundwater Assessment of the Okanagan Basin study, now underway. Greater Vernon Water has two major water supplies, Duteau Creek (domestic and agriculture) and Kalamalka Lake (mainly domestic). As the local population grows, Greater Vernon Water is keen to define areas where water management efficiency can be increased, both through increased storage and reduced water consumption. The Water Source Review study consists of two parts. The first priority is to analyze the potential to increase storage at the headwaters of Duteau Creek, in the current reservoir lakes. The second part of the study will be to determine what improvements are needed at the outlet of Kalamalka Lake and in Vernon Creek. The study will be done by year end 2006. There are two aspects to the Water Supply and Water Quality project at Lakeview Irrigation District (LID), the first one to determine potential water storage sites and the second to field test a method for improving water quality by reducing nutrient levels. Opportunities for additional storage sites exist at a few locations in the watershed, but the feasibility of each must be evaluated. All site assessments were completed in October 2006. 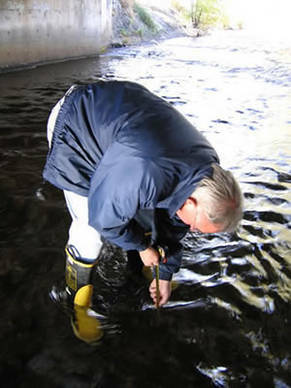 Data collection during spring freshet will be started in 2007, with flow equipment measuring water over the spillways at each of the Lakeview Irrigation District’s reservoirs. The data will be collected over a few years to determine the average potential increase to storage at each location. It has been noted that water diverted from Lambly Creek to the Rose Valley Reservoir accounts for approximately 50% of nutrient loading in the reservoir, which encourages algae growth. LID is currently field testing slow filtration through limestone, as a means to improve the water quality at the point of diversion, attempting to reduce the dissolved nutrients in the reservoir overall. 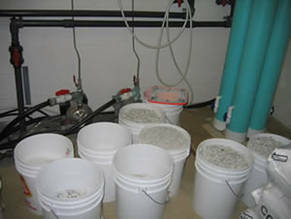 The EECO centre will construct and host a feature exhibit on water conservation and history of use in the Okanagan Valley to be displayed from April to August 2007. Components of the exhibit will focus on water conservation and personal responsibility for the use of water, in addition to highlighting the history of water in the Okanagan. Inspiration for exhibit design was drawn from the Okanagan Waterscape Poster, where portions of the poster will become their own 3-dimensional display unit or station in the exhibit. The EECO centre will also create a Personal Water Conservation Pledge to inspire people to take action in changing their water habits towards conservation. This project is based on the Okanagan Waterscape Poster developed by Natural Resources Canada and many other agencies. SOKS will be developing a teacher resource package to accompany the waterscape poster so that teachers may use the information more effectively in the classroom – at all levels of elementary classes, and some high school grades. The teacher guide will follow BC curriculum using the model built by the Bow Valley River Basin (Alberta) waterscape initiative and their related teacher resource package. Teacher input was solicited towards the end of summer 2006, and SOKS received a variety of useful contributions. The resources developed from this project will be great learning tools for children in the Okanagan. The City of Kelowna is using a WCQI grant to extend the Sensitive Habitat Inventory Mapping (SHIM) to several City creeks – adding to the information gathered for Mill Creek and Bellevue Creek in 2005. 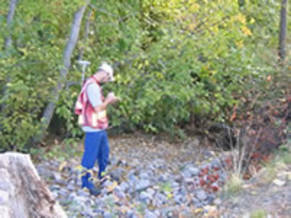 SHIM is a Geographic Information System (GIS) based technique, used to determine the accurate location of creeks, and to identify and inventory their riparian habitats and associated fisheries attributes. This project began in September 2006 and includes but is not limited to – Fascieux, Brandts, Priest, Lebanon, Thompson and Rumohr Creeks. Using high resolution GPS the centre line of the creek is mapped, as are both banks. Both man-made and natural features of each area are recorded – such as erosion, channelization, storm drain location, water license withdrawal, pool areas, riffle areas, and vegetation information for riparian area. The data will be posted on the Community Mapping Network website. The Black Mountain Irrigation District is the largest improvement district in the province with 7150 customers, the majority of being single family residences. The primary water sources for the Black Mountain Irrigation District (BMID) are Scotty and Mission Creeks in the Central Okanagan. The intent of the real time hydrometric monitoring project is to better manage flow in Mission Creek for resource values (fish, wildlife, people) and also allow BMID to better manage water for their customers. In order to achieve this, the BMID is installing a real time data monitor at the Mission Creek intake that will tie into their current SCADA system. In addition, they are creating a data sharing agreement that will allow the BMID to have data from a downstream real time monitoring station operated by the Water Survey of Canada (WSC) sent directly to the BMID stream monitoring computers. Dobson Engineer Consultants, hired to complete this project on behalf of BMID, is completing system design, data sharing agreements and both hardware and software setup. The District of Peachland is using a WCQI grant as partial funding for an ambitious project to install water meters on all residential and commercial (institutional) connections. This is a joint project with all five water suppliers in the Westside Joint Water Commission (WJWC), as all 5 will be using the same company to take advantage of economies of scale. The District of Peachland has signed a contract with Neptune Technology Group who will also undertake a public education component of the metering program. The public education will include door hangers concerning water usage around the home, mail-outs, media releases, and other outreach efforts. There will also be a brochure mailed out that details the timeline and the information for metering, such as how to set up an appointment for installation, the manner in which the meters will be read and other pertinent information. The main portion of the public education campaign will take place in Spring 2007 and metering will take place between January and September 2007. The Westbank Irrigation District will be using a WCQI grant to help support their universal metering program. 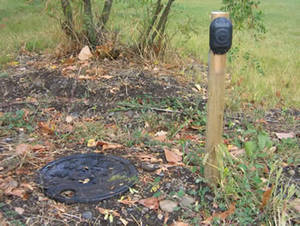 Commercial and residential customers will receive meters between 2006 and 2007, and agricultural customers will receive meters in 2007. The Westbank Irrigation District will be using the same company as other members of the Westside Joint Water Commission, to take advantage of economies of scale. A contract has been entered into with Neptune Technology Group and a brochure mail-out has been created describing how people can make an appointment to have a meter installation. All meter installations will be completed by year end 2007. The Central Okanagan Regional District serves over 160,000 people in what is known as BC’s third largest urban area. As part of development and planning for such a large area, the Central Okanagan Regional District has recently completed an update for the Central Okanagan Foreshore Management Plan, in addition to completing the Central Okanagan Shoreline Inventory in 2005. With a WCQI grant, the Central Okanagan Regional District has commissioned a graphic artist to sketch representations of best management practices highlighted by the Foreshore Plan in order to enhance public understanding. The graphics will portray a range practices applicable to rural and urban developments, tourist, residential, transportation and agricultural uses. Once the graphics are completed, they will be made publicly available in electronic format for use by other organizations in the Okanagan. The Osoyoos Irrigation District has approximately 130 domestic connections and 41 agricultural connections. The District is replacing the flow control valves for all agricultural connections as the current ones are worn through, and some properties are drawing up to 2 times their allotted amounts. The old valves were located underground making any maintenance inconvenient and expensive. This project will see the flow control valves changed to a more reliable type of valve, having them located above ground and with room for future installation of meters. When installations are complete the savings will be significant. Installation of the new valves is expected to be complete by the start of the 2007 irrigation season. 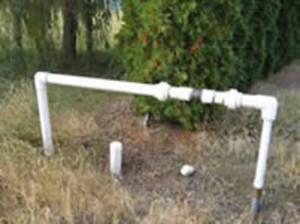 The City of Penticton holds water licenses on both Penticton and Ellis Creeks for irrigation and domestic water supply. 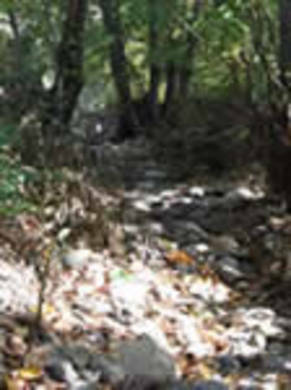 Both creeks are fish producing streams and require adequate flows to be maintained. At the time of grant submission there was no flow monitoring on either of these creeks. Flow measurement is also important for evaluating watershed storage capacity and water conservation measures. The City of Penticton project sought to evaluate the most appropriate method and location at which to measure stream flows in both Penticton and Ellis creeks. City of Penticton determined that flow measurement would occur at a bridge crossing for Penticton creek, which is lined with concrete, creating a solid bottom. 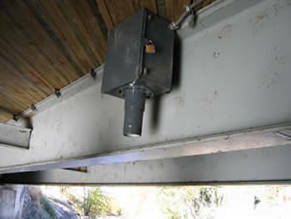 An ultrasonic sensor was installed on the underside of the bridge. The sensor emits a radio frequency to the top of the water in the creek, which is then translated into distance – determining water levels. Flow is then calculated using standard engineering formulas. For Ellis creek, the best location for the same kind of sensor has been assessed, and equipment will be installed at a future date. West Bench Irrigation District (WBID) is located above Penticton in the South Okanagan. The West Bench Irrigation District has 145 acres of irrigated land. The project proposed by the West Bench Irrigation District is to install water meters at all parks, commercial and agricultural locations. The other portion of the project is a public education component including hand delivered newsletters and radio advertising. WBID will be using the City of Penticton’s current information and expertise in purchasing and installing meters.